Thursday, December 20 - The office will close at noon for the KHA Christmas Party. Monday, December 24 to Wednesday, December 26 - The office will be closed for Christmas. Monday, December 31 - The office will close at noon for New Years Eve. Tuesday, January 1- The office will be closed for New Years Day. Happy Holidays from the KHA Staff! Today, the 2014-2015 KHA Board of Trustees officially takes office. Dennis Johnson, president of Hardin Memorial Health in Elizabethtown, will serve as Chair of the Board for the new fiscal year. Kevin Halter, FACHE, chief executive officer of Our Lady of Bellefonte Hospital in Ashland, will serve as Chair-Elect. 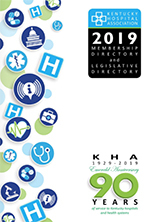 A full listing of all new and returning Board Members is available at http://www.new-kyha.com/Portals/5/NewsDocs/2014-2015KHABoardList.pdf.